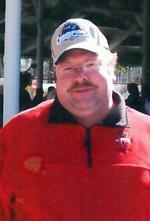 Paul E. Hafner, 50, passed away unexpectedly at his home on June 3, 2018 after a short illness. Born June 3, 1968 in Cambridge, NY, he was the son of Stanley P. Hafner and the late Ann (Dinwiddie) Hafner. Paul graduated from Hudson Falls High School and earned his Associates degree from Adirondack Community College. He went on to earn a Bachelors’ degree from University of Phoenix. Paul proudly served his country in the United States Navy and served as a Seabee. He participated in many area construction projects during the course of his service. On June 5, 1999, Paul married Rosemary Russo at the Kingsbury Wesleyan Church. Paul loved woodworking and was a fan of the New England Patriots. He also loved NASCAR.He was employed in retail for many years, but his true passion was in volunteering. Paul spent many hours helping at the Veteran’s House in Glens Falls, World Awareness Children’s Museum, Sandy Hill Days Committee, Heritage Days Committee, volunteering at the Adirondack Balloon Festival, participating in the For Kids’ Sake Bowling Tournaments, and doing many various charity walks. Left to cherish his memory include his loving wife of 19 years, Rosemary Hafner, his father, Stanley P. Hafner (Linda), His sisters; Deborah Hafner, Karin Campney (Charles), Cathy Ellis (William), Patricia Coutant (Bruce) and Lisa Bickford (Mark), his brother George Hafner (Denise), his brothers-in-law; Steven Russo, Dennis Russo, and Louis Russo (Laura), his sister-in-law Patricia Johnson (Justin), his nieces and nephews; Neil Hafner (Colleen), William Ellis Jr., Nicholas Reid, Christopher Russo, Jessica O’Connor (Michael ), Denise Herrington (Duane) and Katie Russo, several great-nieces and nephews, as well as his fur-babies, Bubba, Peanut, Jelly, and Bandit. A Celebration of Life will be at the Fort Edward Rescue Squad from 3-6pm on Friday August 10, 2018. Arrangements are in the care of the M.B. Kilmer Funeral Home, 82 Broadway, Fort Edward, NY 12828. Memorial donations in Paul’s name can be made to the SPCA of Upstate NY, 588 Queensbury Ave, Queensbury, NY 12804. To leave online condolences please visit www.kilmerfuneralhome.com. To send flowers to the family of Paul Elmer Hafner, please visit our Heartfelt Sympathies Store.